Read the secret message hidden by Don in the code above. Don ka message padhna muskil hi nahin, namunkin bhi hai. 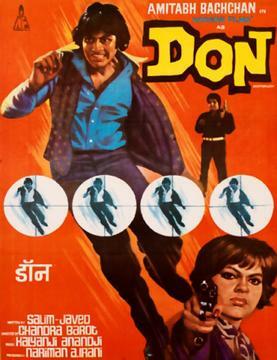 "Don ko pakadna mushkil hi nahi naamumkin hai / डॉन को पकड़ना मुश्किल ही नहीं नामुमकिन है" - It is not only difficult but impossible to catch don. This dialog was made more popular by its remake by the same name by Shah Rukh Khan in the year 2006. Leading to the answer above "Don ka message padhna muskil hi nahin, namunkin bhi hai." - It is not only difficult but impossible to read don's message. "Don Ka Intezaar Toh Gyaarah Mulko Hi Police Kar Rahi Hai / डॉन का इंतज़ार तो ग्यारा मुल्कों पुलिस कर रही है" - Police from eleven countries are waiting for don.